When I was asked by a member of The Native Plant Society if there are any native plants that are restricted to certain rock types, an entire plant community restricted to rare habitats known as “serpentine barrens” instantly came to mind. Serpentine barrens are strange places. Underlain by mottled, greenish-gray, waxy-feeling, asbestos-bearing metamorphic rocks called serpentinites. Serpentinite originates deep in the earth. Once it reaches the surface, it weathers into utterly nasty soils loaded with iron, nickel, chromium, and cobalt (ouch!) Shunned by early settlers and farmers, these soils are toxic for most plants. (a quote, not from Charles Darwin, but from Stephen Spielberg’s Jurassic Park). It turns out that serpentine barrens harbor dozens of extremely rare species of plants and insects that live nowhere else. The nearest serpentine barrens are in Pennsylvania and Maryland, of which a great example is the 1,900-acre Soldiers Delight Natural Environmental Area in Baltimore County, Maryland. Beloved by The Maryland Native Plant Society, it harbors 39 species of rare, threatened, or endangered plants -- sounds like a great excuse for a long-distance field trip. But that’s cheating. What about Ohio? Geologically speaking, it’s a boring place. Our state is covered in sedimentary rock and doesn’t have any igneous or metamorphic outcrops at the surface. However, we do have one of the rarest plants in the world, the endangered Lakeside Daisy, Tetraneuris herbacea, which is completely dependent on a limestone substrate for its existence. 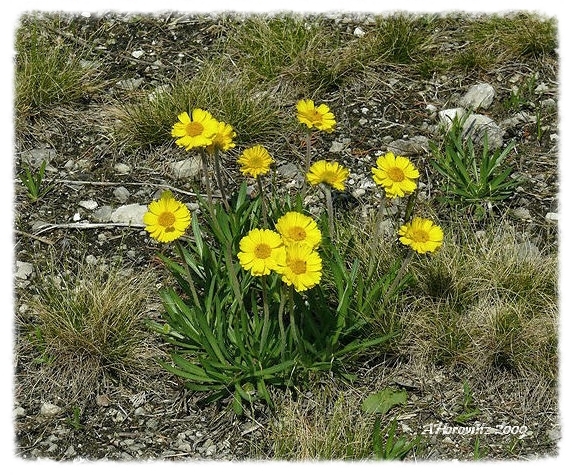 The only remaining naturally-growing community of Lakeside Daisies in the entire United States is in the Lakeside Daisy State Nature Preserve on the Marblehead peninsula in Ottawa County. 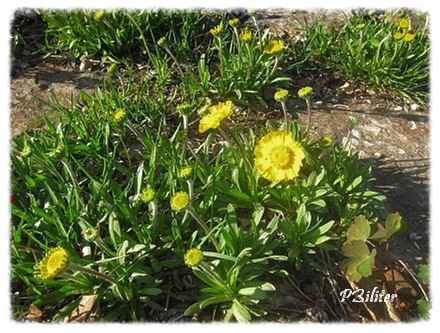 But you don’t have to go to Ottawa County to see living Lakeside Daisies. Thanks to the skill, ingenuity, and determination of botanists at the Holden Arboretum, you can find these are native plants blooming in late spring and early summer in Holden’s Wildflower Garden. corner of the rock, and sure enough, it fizzled! The fizzle is from the reaction of the acid and the calcium carbonate in the limestone releasing carbon dioxide. Other tell-tale hints are the tiny crinoid or sea lily fossils in the rock. The next time you visit The Holden Arboretum, take a short walk from the Visitor Center to the Wildflower Garden to find the limestone outcrop; check out the beautiful little Lakeside Daisy flowers (or their leathery basal rosettes if they aren’t in bloom); and find the fossils of the sea lilies (a marine animal related to starfish) that grew at the bottom of a shallow tropical sea that covered Ohio some 350 million years ago. It’s a great example of where ancient geology and present-day botany come together. We wish to thank and extend appreciation to Ami Horowitz and Tom Sampliner for their photographs and to Patrick Biliter for contributing to our understanding of the natural world through his article and photographs. For a link to Maryland's DNR Soldiers Delight.